More CMs join anti-Bhansali chorus and express angst against film ‘Padmavati’. Padmavati row growing stronger, more states join in the protest against Bhansali’s Film. Poulomi Saha | Mail Today Online | New Delhi | Nov 21, 2017:: Madhya Pradesh chief minister Shivraj Singh Chauhan and his Rajasthan counterpart have announced that they will be banning the film from screening in their respective state.“A film which distorts facts and disrespects rashtra mata Padmavati will not be allowed to screen in any part of Madhya Pradesh,” Chouhan said, adding that the film’s release would be stopped in the state even if the Censor Board cleared it. Following in the footsteps of Chouhan, Punjab chief minister and member of the royal family of Patiala, Capt Amarinder Singh also said that any “distortion of history” will not be accepted. He said he’d been to Chittorgarh (where Rani Padmini allegedly set herself ablaze to protect her honour when Delhi Sultan Alauddin Khilji came to conquer her) and history told a completely different story from that being portrayed in Bhansali’s film. Similar cries to ban the film have been heard in Jammu & Kashmir as well, where Devender Rana, National Conference MLA, wrote to chief minister Mehbooba Mufti and asked her to stop the release of the the film lest it fans aggrieved sentiments in the Jammu region. BJP national general secretary and Haryana state incharge Dr Anil Jain also said the mood in the state was to not release the film if it didn’t delete objectionable scenes. Amid all these, eyes are now on the Central Film Certification Board (CBFC) of India. He added that the CBFC was working at arriving at a “well thought-out and balanced” decision at the earliest. Recently, while speaking exclusively to India Today, Maharana Arvind Singh Mewar of Udaipur had said he was ready to play mediator between the aggrieved groups and the makers of the film. The CBFC, for its part, has returned the film to the producers saying it was missing a disclaimer that would make it clear if the film was based on historical fact or fiction. It has also rejected makers’ request to speed up the certification process. 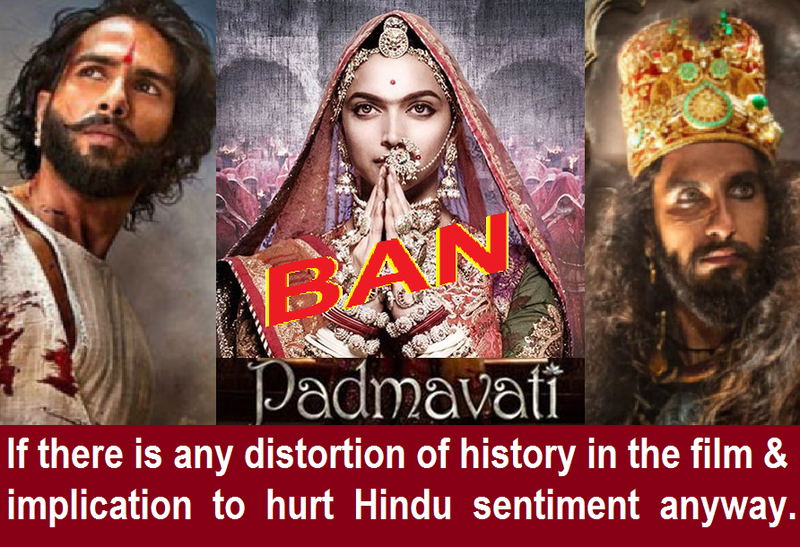 This entry was posted on November 23, 2017 by hinduexistence in Anti Women, Anti-Hindu, Attack on Hindu Sentiments, Attack upon Hindu Sentiment, Attack upon Hindus by Secular, Conspiracy against Hindus, Hindu Protest, Hindu Retaliation and tagged angst against film 'Padmavati', anti-Rajput film 'Padmavati', More CMs join anti-Bhansali chorus, Padmavati in bad light, Padmavati row growing stronger, protest against Bhansali's Film, Rajasthan CM Smt. Vasundhara Raje, Release of Padmavati, Sanjay Leela Bhansali -Padmavati, Shivraj Singh Chauhan.